Green Light New York wants to lower your office’s electricity bill in a big way. Their new study estimates that retrofitting office buildings with daylight harvesting systems that amp up the use of daylight could save a whopping $70 million per year (thats 160 megawatts) on utility bills. Aside from those incredible savings, a daylit office fosters a much better working environment than the buzzy glow of fluorescent lights. New York’s office spaces span around 542 million square feet, dominating much of the real estate market throughout the city. Green Light found that most buildings were built between the 1950s to 1980s, and many have the ability to be easily retrofitted to accommodate daylight harvesting.The study found that about 152 million square feet could be upgraded to use more daylight – all without intrusive or costly construction. By increasing daylighting in these offices, the summer months could become almost free of artificial light, benefiting both the wallets of the office owners, and the city. Cutting back on lighting in these months would also drastically help the grid, as electricity peaks during that time due to the demand to run air conditioners across the city. 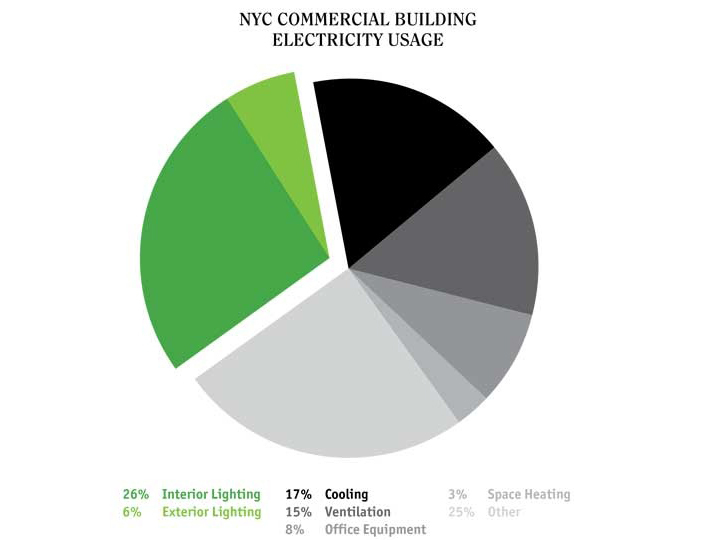 In addition to simple daylight harvesting retrofitting, office buildings can cut energy with efficient LED lights, which Con Ed may be offering an increased rebate on soon. Green Light New York is in the process of developing several daylight harvesting pilot projects, which hopefully will serve as examples for other office buildings to follow suit.